Long gone are the days spent waiting for our mailboxes to fill with 100-page spreads from the world's foremost modern architects, detailing in glossy ink the newest additions to our skylines. No longer are we bogged down by quarter page ads in black and white newspapers, nor do we contribute our tastes to the opinions of academics and big publications. Now, we decide what resonates for ourselves. It's true that there's no better source for design and architectural inspiration than Instagram. From pioneers of the modernist movement to groundbreakers that are quite literally building towards our future, we've rounded up 18 architects to gasp over with every finger tap and scroll. We're willing to bet you've seen Penda all over your Explore feed lately. A geometric dreamland, Penda weaves natural materials with modern sustainability practices and tops it with dazzling botanics to boot. Penda is an interdisciplinary architecture and design studio founded by Vienna-born Chris Precht and Beijing-born Dayong Sun. These two modern maestros met early on in their careers while working together at the Beijing office of architecture giant GRAFT, and were drawn to one another instantly. While Chris preferred all of the left-brain tasks the job required like computer programming, Dayong leaned towards the creative aspects, like design. Though they later left GRAFT in pursuit of Master's degrees, they found their way back to each other in 2012 after Precht won a contest that successfully launched Penda. Located inside of an ancient Hutong (that's a very narrow alleyway) in Beijing, Penda is churning out mindfully crafted modular forms that allow us to glimpse into a peaceful future of environmental balance. On his pristinely curated feed, Chris features Penda's work and provides updates surrounding their projects and events. He also gives insight into the architecture industry, providing commentary, starting conversations, and engaging his audience. Follow Chris here and don't forget to visit the #Penda hashtag. Thank us later. You just can't talk about modern architects without mentioning Frank Gehry. Frank Gehry is a household name and has decades of notoriety to prove it. Most famously, he's the mastermind behind Los Angeles' iconic Walt Disney Concert Hall, and luckily, you don't need a first-class ticket to marvel at it. The Concert Hall's location tag has thousands of posts from every angle, and it's set to only keep growing. Gehry, Toronto-born, became a citizen of the US in the 1940s after relocating to Los Angeles with his family. He returned to L.A. in 1962 after completing his studies under French architect Andre Remondet. He founded Gehry Associates and began honing his now-famous modernist style that combines Bauhaus inspirations with Avant-Garde art. What he called a “synthesis of acoustical and architectural design,” in 1999, The Walt Disney Concert Hall was revealed to the public. Today, it rivals New York's Times Square and Chicago's Bean for best tourist spots in the U.S. Though posts to Gehry's Instagram are rare nowadays, to say the least (his last post was from 2016), the community is still very much active. They celebrate every holiday, novelty or official, birthday, and special event in the comments by hundreds of fans. And though sparse, they do come, and like spending hours of a sun-soaked day perched on the edge of the porch, waiting patiently for the ice cream truck to finally turn the corner, once it arrives, it's so worth it. OFIS Architects has a thing for blue. Scroll through their Instagram for just moments, and you will, too. Modern architects Rok Oman and Spela Videcnik founded OFIS in 1988 are based in Ljubljana, Slovenia, though they work internationally. Their work often harmonizes the indoors with nature, layering industrial materials with (and often inside of!) breathtaking landscapes. Their style is that of unrest. Rok and Spela began working in the early '90s where their home, now the former Yugoslavian Republics, was facing a time of cultural and economic rebirth. The result reads like a response: it's innovative yet cozy, futuristic yet realizable, and spans both commercial and private work. Aside from work within their firm, both Oman and Videcnik are currently faculty at the Harvard Graduate School of Design. Along with their beautifully composed feed, they often share picturesque behind-the-scenes while on-site to Instagram Stories. Don't say we didn't warn you: the FOMO is real. Like Frank Gehry, modernism wouldn't be where it is today had Frank Lloyd Wright never find the urge to create buildings. 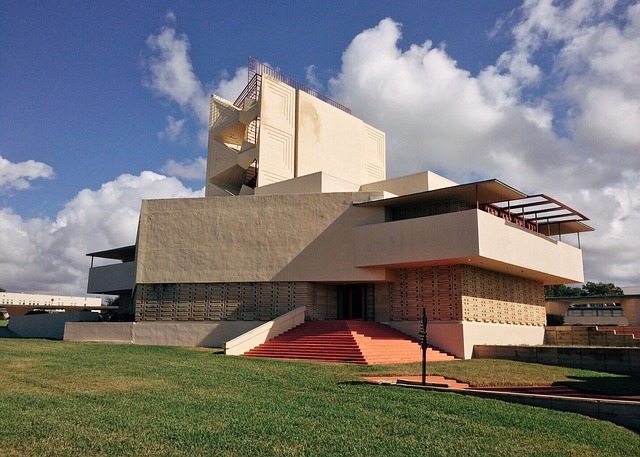 Born in Wisconsin, Wright's path to architecture was anything but random. After college, he became Louis Sullivan's Assistant, quickly rising to Chief Assistant, before starting his own firm. It was there that he solidified his signature style, now known as The Prairie School. With over 500 #WrightSites, as their deemed on The Frank Lloyd Wright Foundation's Instagram, spanning from the U.S. to Japan, his impact left a huge mark on the world. A pioneer in what he deemed “organic architecture,” he lit fire to trends in sustainability far before it cluttered search results on Youtube. On the Foundation's Instagram, they share far more than Wright's body of work. His legacy has built eponymous trusts, fellowships, design programs, and more- all proudly showcased. Keep up with their beautifully designed Stories, too. Deborah Berke Partners is for the designer at heart; the ones that watch HGTV over the news and know the Property Brothers by name. For a good reason, too. New York-based and founded in 1982, Deborah Berke is both an architecture and interior design firm. This apt attention to detail is what sets them – and their feed – apart from the rest. It's also not a coincidence that their portfolio includes The Women's Building. As it's said to be a global axis for the advancement of women's rights, it perfectly reflects their humanistic approach to design and application. Unsurprisingly, their body of work is full of exciting twists and turns. From a former New York, insane asylum turned boutique hotel, to a Pennsylvania residence hall cast in zinc and stone, these modern architects are no stranger to innovation. On their feed, you can find heaps of binge-worthy content. They share collaborations, news from within the firm, publications, and projects in tow. Following just got necessary. Keep up with Deborah Berke here. Zaha Hadid is perhaps one of the world's most foremost modern architects. In her epic career, she founded a worldwide firm that continues to produce prominent designs, as well as teaching at Harvard, Cambridge University, and Columbia. Her most famous works include the Guangzhou Opera House in Guangzhou, China, and the Bridge Pavilion in Zaragoza, Spain. Unlike many of her peers, Zaha Hadid purposely decided not to settle into one genre of architecture. A blend of analytical, studied technology and emotionally crafted art, bodiful with movement, Hadid's style is truly one-of-a-kind, and hailed as such. A look through her Instagram, which shares her past and posthumous projects, and suddenly you're glacially walking through a gallery, glancing at each post twice then three times before moving on. To say she was a well-rounded artist is an understatement, having delved into architecture, fashion, interior, and industrial design, and art, and her Instagram pays homage to this with a variety of posts from all industries. Run, don't walk. Follow Zaha Hadid here. Though Philip Johnson's whole body of work is rich enough to stand up on its own, no project compared to his famous The Glass House. It's such a crucial piece of modern architectural history; it has its own dedicated account that has amassed thousands of fans. The historical museum located in New Canaan, Connecticut, was designed by Philip Johnson for himself to reside in. Finished in 1949 and declared a historical landmark in 1997, The Glass House lives up to its name with fully transparent glass walls on 49 acres. It also features an open floor plan, which is now a staple of modern homes, but for its time was unprecedented. Comprised of 14 structures including the Brick House, (a guesthouse made entirely of, you guessed it, brick) in the present day, it's home to several arts programs and even boasts a summer party celebrating the late Johnson. Get ready for re-posts of visits from admirers, glimpses at other works by Philip Johnson, and très chic interior design. Commence dreaming now. See more of The Glass House here. Jeanne Gang, of Studio Gang, is passionate about two things in architecture: closing the gender pay gap and engaging architecture in the public realm. She made headlines last year after she learned that Studio Gang, the Chicago-based firm she founded in 1997, facilitated a pay gap between men and women, she quickly bridged the gap and spoke out about it. Since, she's been revered by publications and colleagues alike. She also has a particular infatuation with tall buildings. Not only do they draw people living on the outskirts in, with so many homes (as many as 700 in her Aqua Tower project) under one roof, combined with incorporated semi-public outdoor spaces, the feeling of being in the suburbs is captured like a vintage Kodak camera. Modernity and coziness aren't often in sync, but Studio Gang's designs are here to challenge that. Their feed features their impressive projects that span New York to Hawaii, as well as conversation posts that entice onlookers to think more deeply. Their audience isn't shy about joining in, either, and you can often get a response from Jeanne Gang herself. If community is what you're after, start here. Inspiration has never been so easy to come by. Follow Jeanne Gang here. The term ‘Minimalism' entered the vocabularies of modern architects via John Pawson, whether they realized it or not. You needn't know anything about his career to be sure of this, just take one look at his Instagram. The perspective he shares, often saturated, focused moments of sights we take for granted, or, don't even think to take in. When it comes to Instagram, he says it's all about sharing the details that have caught your eye, no matter how mundane. Pawson grew up in Yorkshire, but felt compelled to move to Japan in his mid-twenties. He quickly became besotted with contemporary Japanese design, which then translated into his work when he opened his own studio back in England in 1981. Since, his jaw-dropping designs have extended from Calvin Klein's New York flagship store to London's avant-garde Design Museum. Relaxing like meditation music on a quiet Saturday morning, John Pawson's Instagram is well worth the follow. Meet the architecture Superman of Instagram. A wunderkind in his own right, Bjarke Ingels made a name for himself early in his career. Originally set on studying cartoons and animation, he began studying architecture at the Royal Academy in the hopes that it would improve his artistic talents. Soon, though, he fell under the spell of architecture and went on to form his practice, Bjarke Ingels Group, or BIG, in 2005. With offices in New York and Copenhagen, BIG's approach is refreshingly new. With over half a million followers, Ingels must be doing something right. His projects are among the most massive on the list; (his most recent being the Xi Building in New York, which will contribute a contemporary viewpoint to its iconic skyline.) many posts require aerial shots to capture his work in its full glory. Resonating with BIG's ethos, Ingels' Instagram has a counterpoint to its razzle dazzle that we don't often see among modern architects on Instagram. He also features his kids, family, and even a selfie or two. Time to start obsessing. Follow Bjarke Ingels here. To summarize David Adjaye's resume in one word: impressive. Seemingly predestined for success, upon his graduation from London South Bank University in 1990, he was nominated for and later won the RIBA Bronze Medal for best design project at his level. This propelled his career forward, and soon he founded his world-renowned eponymous studio. Recognized as a leading architect of his generation, his credits include Designer of the Year at Design Miami and being knighted by the Queen for his services to Architecture. Have we convinced you, yet? Since the late '90s, Adjaye has raised the bar for modern architects with his unique sculptural perspective and keen artistic sense. His recent projects include designing the captivating, solid glass BRIT Award for recipients to take home, and a current exhibition, Making Memory, at the Design Museum in London. Like his username suggests, Adjaye's Instagram reads like a friend's sketchbook you've graciously been invited to peek at. Born in Mexico City, Escobedo went on to study Architecture at the Universidad Iberoamericana before obtaining a master's degree in Public Art at the Harvard's Graduate School of Design. After founding her studio in 2006, Escobedo has projects that span Mexico, California, Lisbon, and London. Some of her most notable work includes a gallery built in the former home of Fine Artist David Alfaro Siqueiros and an installation at the Victoria & Albert Museum in London. Her most recent work, Serpentine Pavilion, which was opened to the public last June, includes a courtyard and pool framed with lattice walls and mirrored canopies. With Serpentine Pavilion, Escobedo is the youngest architect among her field to receive the esteemed annual commission. One scroll and you'll want to unfollow every travel account. Why ruin your ratio when you've got a feed this beautiful? Don't believe us? Just watch. Follow Frida Escobedo here. Japanese architect Sou Fujimoto is anything but up-and-coming. After graduating from Tokyo University in ‘94 and establishing Sou Fujimoto Architects in 2000, Fujimoto has kept his repertoire full and his schedule busy. In fact, in the last year alone, his projects include incredibly diverse structures spanning France, Switzerland, Hungary, and Prague. It's not surprising, as in Fujimoto received the Architectural Review Awards prize for emerging personalities in the world of architecture not once, but three years in a row. His works exist between nature and technology, organic and artificial. It's less of a blend, and more of an intentionally curated juxtaposition. You'll be glad to know he dishes out scenic views and glimpses of his work regularly. Your community awaits. Follow Sou Fujimoto here. Another crucial piece of modernist architecture history, Herzog & de Meuron Architekten, founded in 1978, is a Swiss architecture firm located in Basel, Switzerland. It's well-known that lives of Jacques Herzog and Pierre de Meuron mirrored one another, starting with their mutual attending of the Swiss Federal Institute of Technology in Zürich, and leading to their tight-knight, collaborative career. Famously, the dynamic duo transformed the Bankside Power Station in London into what is now the Tate Museum of Modern Art. Herzog & de Meuron have established a legacy that's far extended their base in Basel, including the wintry Swiss Alps, urban Vancouver, and most recently, captivating villas in South Switzerland. Their style isn't known to be subtle, but their regard for longevity, livability, and detail, continues to inspire waves of modern architects throughout time. Their feed is, true to their style, refined, professional, and modern. It'll have you applying to Architecture schools in no time. Follow the dream team here. Surprise: this British architect is actually a Canadian. Born in Toronto, Canada, Brooks graduated from the School of Architecture at the University of Waterloo in 1988. It's then that she moved to London, and in 1996, built Alison Brooks Architects. There, she offhandedly created an ethos that parallels her mindset, which one would more often liken to a research student. Her work has been radical in the exploration of urban sustainable housing and infrastructure. Alison Brooks is through and through a Canadian, but after 30 years, she was tapped made her grand return to Canada. Currently, a neighborhood in Vancouver, designed and built by Alison Brooks Architects, is underway. Brooks is easily ranked among Europe's best, taking home a steady stream of awards for her pioneering approach to architecture in the public realm. Brooks is currently the only British architect to receive each of the U.K.'s most celebrated awards for architecture: the Manser Medal, the RIBA Stirling Prize, and Stephen Lawrence Prize. ​Ready to get radical? Follow her here. You know the Eames chair, but do you know the duo behind it? Husband-and-wife team Charles and Ray Eames spearheaded what many call the most formative design office of the mid-twentieth century. Together, Charles, having studied Architecture, and Ray having studied art, blossomed an unprecedented approach to blending industrial materials and creative functionality. Not only did their work shine as a legacy unfolded upon American design and architecture, but the pair were what might be known today as cultural influencers. Often seen in matching clothes, the quirky couple were as beautiful as their Hollywood counterparts of the time. They pridefully advertised their studious and devout life to creating art, and their Los Angeles studio became an everlasting symbol of their dedication. Today, Eames Office keeps their legacy alive with frequent posts and Instagram stories, so you, too, can celebrate their history. Oscar season may be over for the year, but you can already set your sights on the awards for next year, via the brand new Academy Museum designed by Piano, currently nearing completion in Los Angeles. Italian architect Renzo Piano has a long line of commercial and public works under his belt and is perhaps most known for his work on museums. The word “delicate” often surrounds his work, as his immense attention to the minute details like lines and curvature has captivated the world. A recipient of the Pritzker Prize in 1998 for his design of the Pompidou museum, comparisons to his work reached an all-time high, for the better, when the Pritzker Jury likened him to Leonardo da Vinci, Michelangelo, and Brunelleschi, priding his curiosity and problem-solving skills. The worldwide success of the Pompidou project surged Piano forward to a career-long series of commissions which include the Menil Collection in Houston and the Centro Botín Art Museum in Santander. Today, Renzo Piano, like Frank Gehry, is synonymous with museum design, but his other works reveal his vast range in creativity and design. Looking for a more humanistic approach to your feed? Look no further. Piano's feed includes looks into his workshop, which empowers young architects with knowledge and hands-on experience. Soul food for the eyes. Follow Renzo Piano here. Shindelmindel is the architecture firm spearheaded by Lee F. Mindel. After the dissolution of Shelton, Mindel & Associates after Peter Shelton's passing, Lee F. Mindel had upheld their legacy of harmoniously intertwining luxury with functional design. In his career, along with his colleagues, he's received 25 awards from the American Institute of Architects and the highly prestigious Cooper-Hewitt National Design Award for Interior Design. Mindel is widely adored as a leader in the mid-century modern movement, with his frequent use of luxe furniture and embellishments that compliment his nearly geometric, linear eye for design. Shindelmindel is comprised of an array of groundbreaking modern architects, but what sets them apart is their ode-like approach to incorporating vintage and historical elements to their construction. Each addition looks manicured and thoughtful; like someone poured over every library in the country to execute it just so. Curatorial in its application, you can expect to find nothing less from Mindel's Instagram. With the additional humanistic touch, like a candid photo of Mindel visiting the LOVE structure in Philadelphia, this is an account to get behind. There's no shortage of incredible architects to follow on Instagram, and the community only grows larger each day. Just think, it could be you that builds the next Sydney Opera House or Empire State Building. Just make sure to do your research first, or you may end up building the next Leaning Tower of Pisa. With this roundup of modern architects from the birth to the pinnacle of modernism, oil your creative gears and get inspired. With these modern muses overflowing your feed, there's no stopping your innovation.